413 Commonwealth is located on the north side of Commonwealth, between Massachusetts Avenue and Charlesgate East, with 411 Commonwealth to the east and 415 Commonwealth to the west. 413 Commonwealth was designed by architects McKim, Mead, and White and built in 1890-1891 by Benjamin D. Whitcomb & Co., builders, one of a symmetrical pair of houses (413-415 Commonwealth) built for law partners Francis Inman Amory and Richard Olney. Francis Amory is shown as the owner of 413 Commonwealth on the original building permit application, dated November 12, 1890. 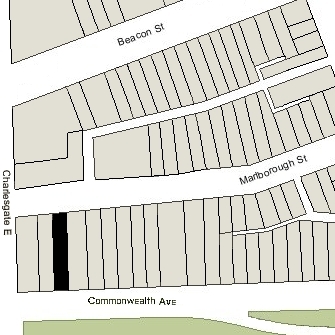 The rear of the lot on which 413 Commonwealth was built extends north to Marlborough Street and has a secondary street address of 462 Marlborough. The land for 413 Commonwealth was purchased on May 28, 1890, by Francis Amory’s wife, Grace Josephine (Minot) Amory, from Walter Hunnewell. It was part of a 125 foot wide lot running east from Charlesgate East that Walter Hunnewell had purchased on December 21, 1885, from a real estate investment trust formed by Francis A. Palfrey, Francis A. Osborn, and Grenville T. W. Braman. The lot was part of a tract of land the trust had purchased on June 1, 1880, from the Boston Water Power Company. Click here for an index to the deeds for 413 Commonwealth, and click here for further information on the land west of Massachusetts Avenue between the south side of Beacon and the north side of Commonwealth. By the 1892-1893 winter season, Francis and Grace (Minot) Amory had made 413 Commonwealth their home. They previously had lived at 168 Beacon. They also maintained a home in Beverly. During the 1904-1905 winter season the Amorys were traveling in Europe and 413 Commonwealth was the home of Frederick Lothrop Ames, Jr., and his wife, Edith Callender (Cryder) Ames. They had been married in May of 1904, and 413 Commonwealth may have been their first home together. By the 1905-1906 season, Frederick and Edith Ames had moved to his family home at 306 Dartmouth, where he had lived before their marriage, and Francis and Grace Amory had resumed living at 413 Commonwealth. Grace Amory died in April of 1911. Francis Amory continued to live at 413 Commonwealth with their children, Mary Josephine Amory, Charles Minot Amory, and Francis Inman Amory, Jr.
Mary Amory married in June of 1914 to Fulton Cutting, a radio engineer and manufacturer, and moved to Tuxedo Park, New York. Charles Amory, an investment banker, married in July of 1913 to Gladys Mildred Munn. After their marriage, they lived at 413 Commonwealth with his father until about 1918, when they moved to Beverly. Francis Amory, Jr., married in January of 1921 to Margaret Mae Perin. After their marriage, they lived at 73 Beacon. Francis Amory died in January of 1921, on the same day as his son’s marriage. 413 Commonwealth. 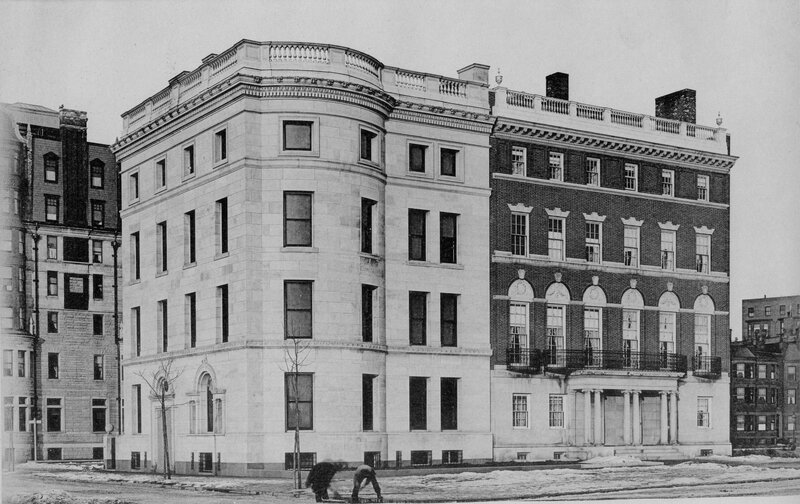 413 Commonwealth continued to be owned by the Grace Amory’s estate and leased to others. 413 Commonwealth was not listed in the 1922 Blue Book. During the 1922-1923 winter season, 413 Commonwealth was the home of shoe manufacturer George A. Brown and his wife, Nellie Chandler (Towne) Brown. Their usual residence was in Swampscott. By the 1923-1924 winter season, 413 Commonwealth was once again the home of Edith (Cryder) Ames, whose husband, Frederick Lothrop Ames, had died in June of 1921. They had continued to live at 306 Dartmouth and in North Easton until his death. She continued to maintain her home in North Easton and also a home in Newport. Frederick and Edith Ames’s two children, Frederick Lothrop Ames, III, and Mary Callender Ames, lived with her. Frederick Ames, III, was a student at Harvard and an avid yachtsman and aviator. In 1926, he and a small crew had sailed his 44-foot schooner across the Atlantic to race in the Cowes regatta in England, sailing it back in 1927. He bought his first airplane in 1925 and, according to a January 27, 1928, Boston Globe article, was “New England’s first ‘sporting airplane pilot,’” building a landing field for himself at the Ames family’s North Easton home. In December of 1927, he set off on a flying tour of the western United States and Mexico. In January of 1928, he met and married Miss Maurice Willard, known as “Mlle. Maurice Mozette,” a singer at the Club Royale in Nogales, Arizona. Originally from Freeborn, Minnesota, she had been an opera singer in Europe, where she also learned to drive race cars, an avocation she continued when she returned to the United States. 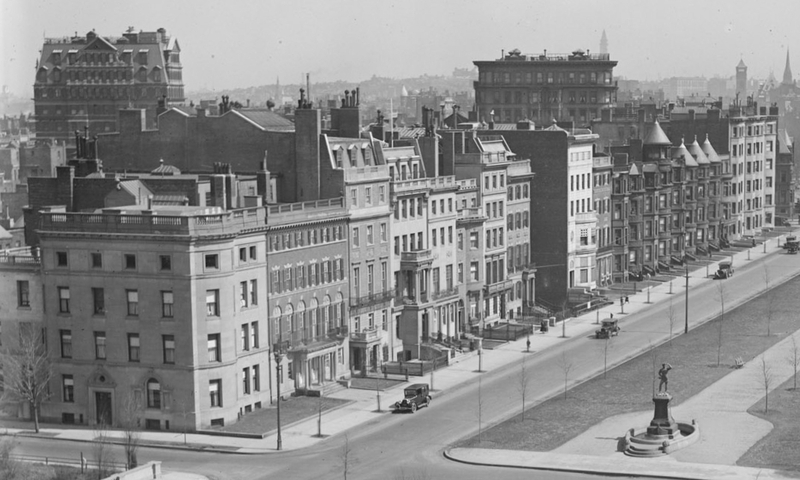 They returned to Boston and North Easton, and were living at the Ritz-Carlton Hotel during the 1928-1929 winter season. On November 6, 1932, Frederick Ames, III, was killed when the airplane he was piloting crashed at Tower Hill in Randolph. Maurice Ames was not on board. She later married again, to composer Ernest (“Bunny”) Charles (born Ernest Charles Grosskopf) and lived in Beverly Hills. 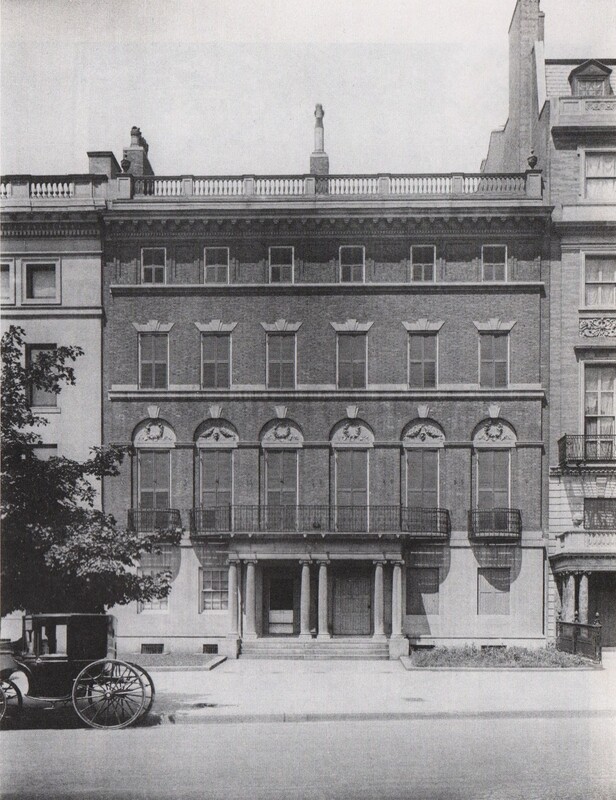 Edith Ames and her daughter, Mary, continued to live at 413 Commonwealth during the 1927-1928 season, but moved thereafter to Newport and spent the next winter season in New York City, where Mary Ames married in January of 1930 to Howard Gardiner Cushing and Edith Ames married in May of 1931 to Roger Wilson Cutler. Roger Cutler previously had been married to Leslie (Bradley) Cutler, daughter of Robert S. Bradley and Leslie (Newell) Bradley, who lived at 411 Commonwealth; Roger and Leslie Cutler had divorced in 1928. By the 1928-1929 winter season, 413 Commonwealth was the home of Francis Inman Amory, Jr., and Margaret Mae (Perin) Amory. He was a stockbroker. They also maintained a home in Beverly Farms, which previously had been their year-round residence. The Amorys continued to live at 413 Commonwealth in 1938, but by 1939 had moved to the Maryland Apartments at 512 Beacon. On January 6, 1938, the Provident Institution for Savings foreclosed on a mortgage it held on 413 Commonwealth and took possession of the property. On August 29, 1940, 413 Commonwealth was purchased from the bank by the Garland School of Homemaking (later Garland Junior College). It also owned 409 Commonwealth and 337-343 Commonwealth. In September of 1940, it filed for (and subsequently received) permission to convert 413 Commonwealth from a single-family dwelling into a school building. In June of 1942, Garland School acquired 415 Commonwealth and in 1944 it acquired 411 Commonwealth. 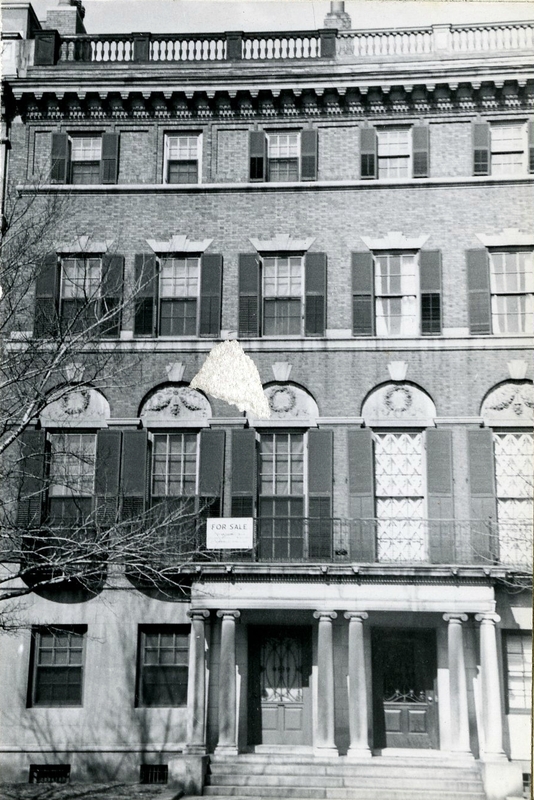 In June of 1949, it filed for (and subsequently received) permission to combine 413 and 415 Commonwealth into one property, including removing portions of the party wall between the two buildings. 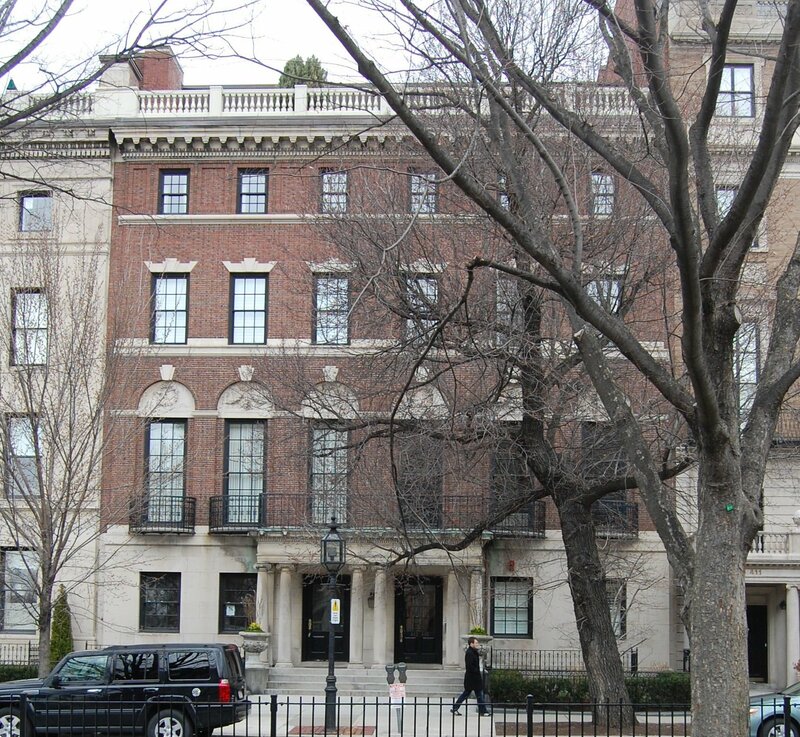 By the late 1960s, Garland Junior College had assembled a portfolio of 22 properties in the western portion of the Back Bay: 315, 319, 321, 329, 337, 339, 341, 343, 349, 377, 407, 409, 411, 413-415 Commonwealth, 24 Charlesgate East (419 Commonwealth), and 447, 449, and 451 Marlborough (composed of 451-457 Marlborough). In November of 2005, Terra Green II LLC filed for (and subsequently received) permission to convert 413-415 Commonwealth into nine apartments and an interior garage. At the same time, it also filed for (and subsequently received) permission to convert 24 Charlesgate East (419 Commonwealth) into four apartments and an interior garage. The two buildings – 413-415 Commonwealth and 24 Charlesgate East (419 Commonwealth) – remained separate buildings, with the latter having the street address of 419 Commonwealth. In the condominium master deed, it specified that the conversion was Phase I of The Meads, and that Phase II would be to convert 407-409-411 Commonwealth. Instead, in November of 2010, it sold those properties, along with 451 Marlborough, to HD 407-411 LLC, formed by the Holland Development Company, which remodeled and converted them into condominium units.